**Our own Gretchen McNeil (and yeah, I totally claim her. OURS OURS OURS!) has a cover for her book now! Take a look! **And now, for today's review. This past weekend, I was fortunate to meet the talented Kathryn Otoshi, author and illustrator of a number of picture books. During a workshop at the San Francisco Writers Conference, Kathryn read ONE out loud, and I fell in love with this book. Seriously. It gave me shivers. Read on and see why. The Reading Room summary: When the colors cannot get along, One shows all the colors how to stand up, stand together, and count. As budding young readers learn about numbers, counting, and primary and secondary colors, they also learn about accepting each other's differences. Full color. I rarely review picture books. It's not that I don't love them. It's just that I'm a YA writer and there are so many YA books and only so many Bookanista Thursdays in which to review them. So it has to be a particularly special picture book for me to review it. And let me tell you, this one is it. The illustrations, though simple, are quite lovely and colorful. It would draw any child's eye. But it's the story that sold me. Because although ONE is in many ways educational, teaching kids counting and colors, it also deals with the issue of bullying. I know, right? How does an author pull those elements together? Not without serious thought, I'm sure. The basic premise is that the color red is bullying all the other colors, but blue especially. And no one will defend Blue or do anything about it. Until one day One arrives and stands up to Red. No matter what Red says, One will not back down. This is enough to encourage the colors, one by one, to stand up to Red and be counted. And in the end, Blue finally finds his voice, too, and lets himself also be counted--Blue finally sees his own worth and understands that he, too, has value. And all it took was One to stand up to the bully. It's a pretty powerful message, I think. Mob mentality works both ways--to create bullies, but also to bring them down. In keeping silent, all the colors aided and abetted the bullying of poor Blue. But once One spoke up, and then all the rest and the rest, the mob of "worthy" colors knocked Red down to size. Of course, it's cool that this book will also help kiddos learn to count and recognize colors, but the message behind it makes this book stand out. Bullies exist at any age; you never know what your child is facing on the playground or at preschool--your child may not even realize that he's being bullied. ONE can open up that conversation with the tiny tot. And given that bullying is a huge issue, it seems there's no age too young to discuss it. My hat's off to Ms. Otoshi. I'm impressed with this one (this ONE). ONE is currently available for purchase. 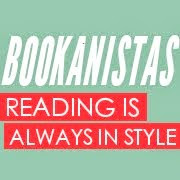 Be sure to check out what the other Bookanistas are highlighting! ** Click here to join The Bookanista Book Club at The Reading Room where you can check out all the books we're buzzing about! In sad news, the literary world lost a major talent yesterday: YA author Lisa Wolfson, known as LK Madigan, has lost her battle with cancer. Go here to read a beautiful tribute from her literary agent Jennifer Laughran. My heart goes out to her family and all those who knew and loved her. Thank you for posting this review of one - it is never too early to encourage children to see what happens when they do, or don't, stand up and look after each other. Thank you for adding the link above. I'm feeling sad that Lisa's loss is now being borne by her family, friends and to her readers too. I'm also reminded to cherish every moment and those who are dear to me. I love that this is something different for most of us...what a cool concept! Thanks for sharing! AND the cover of Possess? FANTASTIC!!! My heart goes out to Lisa and her family today. I was so sad to hear we lost Lisa. My thoughts and prayers are with her family and friends. I'm shocked that this is a picture book! It sounds like it should be required reading in all early classrooms. Maybe a donation is in order. That book sounds great...though I can't wrap my head around how it accomplishes all that. I guess I just don't think like a picture book author! I'm so sad to hear about L.K. Madigan. Truly, a loss. What a lovely post. You honored a literary great, I admire that. I love your blog. I was so sad to hear of Lisa's passing. My thoughts are with her friend's and family. Love the cover of Possess. Love the cover of One. I love the premise of One. And, it *almost* makes me want to have another baby, just so I can read books like this again with my children. And, my prayers are with Lisa's family and close friends. This world lost a bright light yesterday. I am stopped short by the sad news of Lisa's passing and am hmubled after reading her last post. Perspective is very grounding thing isn't it. Congrats to Gretchen, that is an AWESOME cover! I just ordered One! Like you I had to read it after listening to Kathryn talk about it. Now that I've read your review I can't wait for it to arrive! Possess looks awesome. The cover is so great. I'm also going to look out for One. Thanks for sharing these excellent books. Wow, I love the idea of ONE. What a great book! I want ONE!! I must have it. Now. That is such a great book cover for Possess! I know nothing about the book and I want to read it. Possess looks scary but awesome! I don't think any of us are going to easily forget Lisa! the cover for possess is SWOON-WORTHY! and l.k. madigan--:(. so sad, really. ONE is definitely a great book. And so is Otoshi's follow up, ZERO. Great review, Carol. I think it is extremely important for writers to review things that are not in their usual category. I'll be posting a film review soon and I frequently post reviews of music. This book looks like a great gift for my nephew. Thanks so much! I head about LK Madigan. My prayers to her family and friends as well.